Some jerk with a hacksaw cut through my porch railing and took my new commuter bike. My renter’s insurance deductible was $1,000, so I’m out $800 and I can’t afford to replace it new. 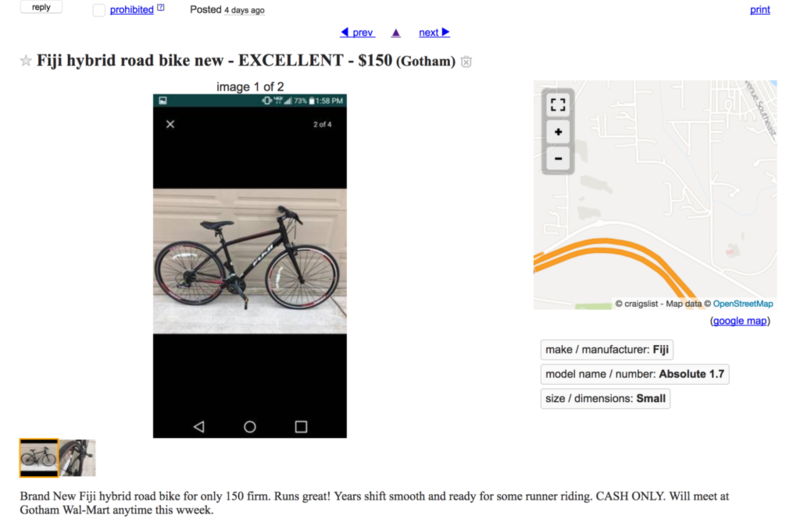 I plan to buy a used bike, but I fear that everything on craigslist is stolen. What can I do to make sure that the bike is clear so that I’m not helping create demand for stolen bikes? Inspect the ad for clues. Stolen bike listings often look pretty legitimate, but there are a couple of signs you can look for that suggest it might not be on the up-and-up. Beware of stock (or poor quality) photos posted to hide or disguise identifying marks or unique components. Poor spelling, or deliberately misspelled manufacturers (e.g., “Fiji” instead of “Fuji”) or model names are used to throw off the scent of victims. Thin information about the bike can also be a warning sign. Is the price too good to be true? If the ad looks pretty good, check around for similar bikes and see what the going price is on other used sites. You can also try Bicycle Blue Book for a reference price. If the price is really low, it’s definitely something you’ll want to probe on. Research the seller. Some sites like eBay and OfferUp offer decent tools to look into the seller’s seller history and ratings. Are they a brand new seller with no ratings? Do they have lots of bikes for sales with similarly suspicious descriptions? If the seller looks bad, stay away – and be sure to report your suspicion to the site you found them on. Ask tough questions online. Legitimate sellers are willing to answer detailed questions and will put time into quality responses. Inquire about any red flags from the ad or the seller. Ask them for any specific details about the bike that an owner should know – how long they’ve had it, where they bought it, when the last repair was and what it was. If it still feels good, go ahead and ask for the serial number of the bike and take a full screenshot of the ad and print it out. Ask more questions in person. If all is well with your initial investigation, go ahead and schedule a meet. Make sure to get the seller’s phone number and setup the meeting in a well-lit public place and bring a friend along if at all possible. Be sure to look for any discrepancies from the online posting (you brought the printout of the ad right?) and ask about it. Look specifically for any scratches or dents on the frame that could be signs of force used to remove a lock. Take it for a test ride and run the serial number and description on 529 Garage. If it all feels good, make the buy and ask for a Bill of Sale from the seller. At any point in the process you come across a bike or seller that is fishy, be sure to report them to the site and to screenshot the entire ad so that you can provide it back to the site or the police if need be. While this seems like overkill in today’s convenience economy, this is an appropriate level of detail to get into on a used bike. If you’re saving a few hundred dollars, the extra time is worth it and in nearly all cities, if you are in possession of a stolen bike, the police can seize it from you without reimbursing you for your outlay. For this reason, I strongly recommend getting a dated bill of sale and immediately register your bike with 529 Garage to make sure that you have a record of ownership. 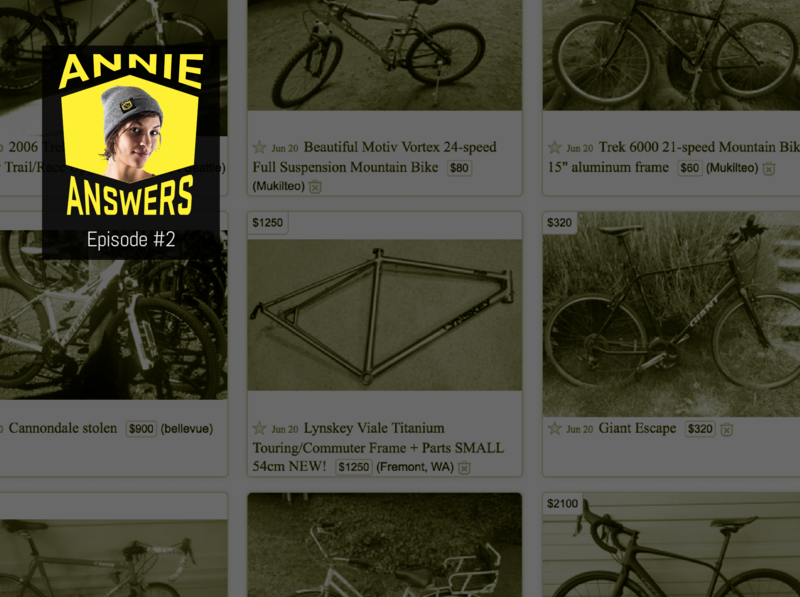 Of course, you can always skip the general reseller sites and go to either an online reseller that specializes in bikes (we’re fans of The Pro’s Closet), or visit a local shop that specializes in used bikes. You won’t get the same selection, but resellers specializing in bikes generally take extra steps to make sure that the bikes are clean and will also make sure that they are safe and in good condition!